Roberto Simon | Leadership | About | WEX Inc.
Roberto joined the WEX team in 2016, bringing his vast global experience to Portland, Maine. For the past 15 years, Roberto held financial leadership roles, managing organic and M&A business growth across the Americas, Europe and Africa. He moved to the U.S. in 2007 and grew from financial analyst to CFO of a company that was sold to Revlon, Inc. He was later promoted to CFO of Revlon, overseeing its global finance and IT operations. 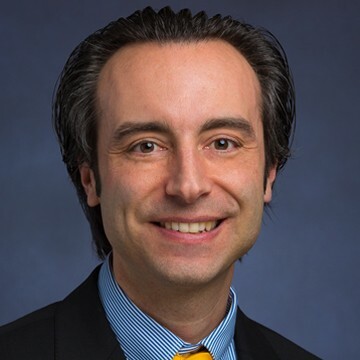 Originally from Spain, Roberto speaks five languages (English, Spanish, Italian, Catalan, and French) and holds a bachelor’s degree in business administration from the University of Barcelona in Spain, as well as a master’s degree in business administration from ESADE Business School in Barcelona. Some people like a routine, but that’s not me. I love multitasking—it helps keeps my brain engaged switching from one project to another, whether it’s quarterly closings, acquisitions or board presentations. I like to think in extremes and challenge the team that way. Extreme positive and extreme negative situations help people open their minds to a wide range of possibilities and plan accordingly. I like experiencing diversity and learning from people from different countries and backgrounds. I’ve lived everywhere from South Africa to Denver and many places in between. As long as I have good work and a happy family, I can live anywhere in the world.